You can have the best product in the world but if the customer doesn’t feel connected to you, they don’t buy from you. 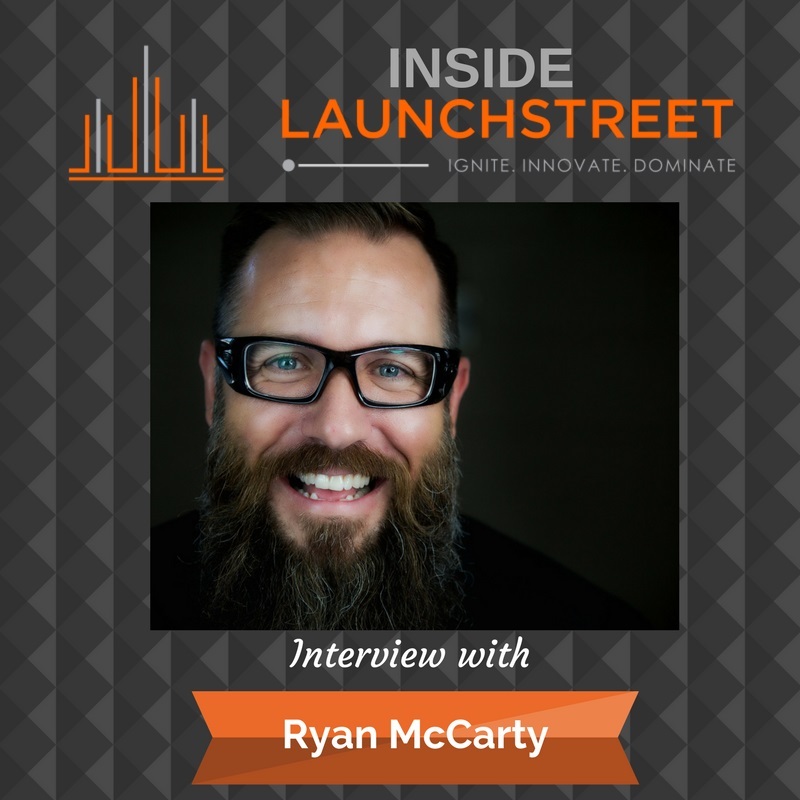 And that’s why I interviewed this guy — Ryan McCarty — on Inside LaunchStreet. He is an author, speaker, and the co-founder of Culture of Good, Inc. Building upon the success of his award-winning program at TCC Verizon, Ryan and TCC Verizon CEO Scott Moorehead created Culture of Good to teach for-profit companies how to operate with the soul of a non-profit. We talk about how to scale little moments into a movement that has a lasting impact. Why companies that focus on doing good increase their employee engagement, productivity, innovation, and bottom line. It turns out that when people feel connected to a purpose, they work harder, regardless of the job. Also, consumers don’t engage with business just for the products, they want to know your story and that you do good in the world. We don’t buy transactionally, we buy relationally. How your culture is your greatest differentiator and your greatest risk. [2:30] You might be surprised to know that Ryan has cut his own hair since he was twelve. In case you need a haircut, he also cuts his friends’ hair. [4:29] Get introduced to the term “soulular work.” Ryan has always been involved to give back and felt like the for-profits were missing the feeling of connecting people to their life purpose and calling. [8:27] Once you give employees an opportunity to do something meaningful, they know their own impact. Productivity increases and results in the business are astronomical. Ryan believes that profit and purpose don’t have to be separate. [10:38] Ryan talks about building a culture of good in his book, Build A Culture of Good: Unleash Results by Letting Your Employees Bring Their Soul to Work. Ryan and Tamara talk about Chapter 4: Connecting moments into a movement. Ryan shares how giving away backpacks with school supplies led him to create the movement to help the employees of TCC Verizon connect their “why with their what.” This made a huge impact on the employees. You must make moments into movements, by creating a strategy of giving back and doing good. Ryan and TCC Verizon CEO Scott Moorehead, created a movement with three tiers: Big good, our good, my good. This speaks to every individual employee by connecting with the individual good, the team good and the corporate good. [17:16] Since the launch of Culture of Good, same-store sales are up forty percent. A major part of the Culture of Good is teaching employees that their everyday work impacts the business. The business can then turn around and do more good year-to-year. Tamara challenges listeners to think about what your culture of good looks like and what your connection looks like. [20:12] People are no longer engaging with companies solely because of the product. Ryan highlights Rosa’s Fresh Pizza, in Philadelphia. They have a culture of good by allowing people to pay an extra dollar, write a kind note and post it on the wall. Homeless people can then get a note off the wall and leave with a piece of pizza. [23:10] Tamara highlights chapters 6 and 7: Making employees and customers better. Listen in as Ryan discusses the difference between transactional or relational customers. We are all customers of something. The engagement is different when you are willing to listen and care about the customer. Nothing is greater in a person’s life than when you’re serving with someone. If you can give that opportunity to a customer, they will be a customer for life. [26:27] Listen in to find out why your culture is your greatest differentiator and also your greatest risk. [35:59] Tamara recently partnered up with Steve’s Club to help at-risk youth. Ryan feels that sharing good is contagious. It helps other people get involved. [42:17] Profit can be an amazing catalyst for doing good. Your passion can be both profit and purpose. They can work together for synergy. [44:46] It takes profit to make a change. [45:21] Connect with Ryan and purchase his book at Culture of Good. Also, connect on Twitter, Facebook, and LinkedIn. [46:55] Where should LaunchStreeter’s begin to create a culture of good? [48:19] Tamara asks listeners if they’re playing in a transactional space. It’s hard to innovate if you’re being transactional. She challenges listeners to go to Inside Launchstreet and watch the videos about customer innovation.